Get Email Signups By SMS | Brand On! 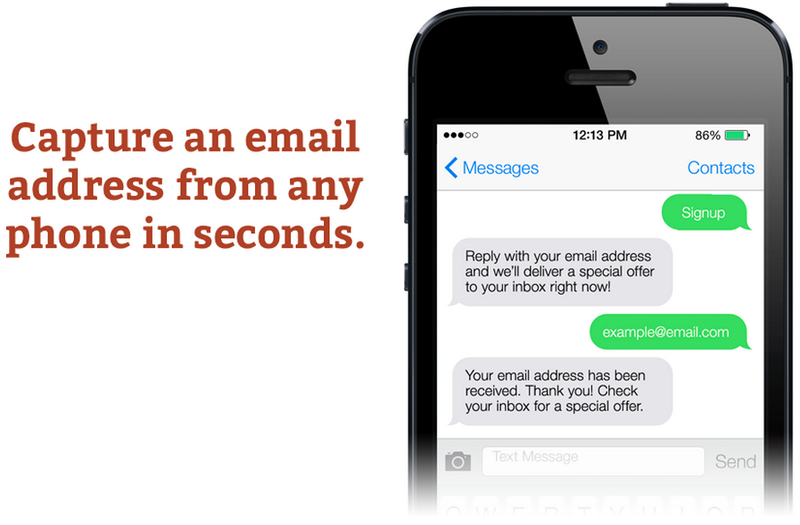 Now you can easily capture email signups by SMS with JoinByText. It integrates with several email service providers and marketing automation companies including ActiveCampaign, AWeber, Campaigner, Emma, iContact, InfusionSoft, MailChimp and Publicaster by WhatCounts. After signing up, you get to pick a one-word keyword that people can send to a 5-digit shortcode assigned to your account. When they do, they are prompted to enter their email address to join your list. Cost: $19/month to capture up to 500 email addresses; larger plans are available. Thanks to DJ Waldow for tipping me off to JoinByText!